PITTSBURGH—Internationally acclaimed conductor and violinist Joseph Silverstein will guest conduct the Carnegie Mellon University Philharmonic Chamber Orchestra at 7:30 p.m., Sunday, Oct. 13, at Carnegie Music Hall in Oakland. Silverstein will be the first in a series of guest conductors this year with the orchestras. He will be the featured soloist on Mozart's "Concerto No. 4 in D Major." The concert also features Beethoven's "Leonore Overture No. 3," Stravinsky's "Pulcinella Suite," and Prokofiev's "Symphony No. 1 in D Major 'Classical.'" Silverstein was music director of the Utah Symphony Orchestra from 1983 through 1998 and became Conductor Laureate in the 1998-99 season. He served as music director of the Chautauqua Symphony from 1986 through the 1988-89 season and also has served as principal guest conductor of Seattle's Northwest Chamber Orchestra. As a conductor and soloist, he has appeared with hundreds of orchestras in the United States, the Far East, Israel and Europe. In recent years, he appeared in recital in Boston, New York, Cleveland, Detroit and Philadelphia. Silverstein has conducted and appeared as a soloist with the Pittsburgh Symphony, the Detroit Symphony, the Milwaukee Symphony, the Utah Symphony, the New Jersey Symphony, the Minnesota Orchestra, the Rochester Philharmonic, the St. Paul Chamber Orchestra, the San Antonio Symphony, Symphony Silicon Valley, France's Orchestre Nationale de Lille, the Berlin Symphony and the National Symphony Orchestra of Taiwan. In addition, he has appeared at the Verbier Festival in Switzerland, the Aldeburgh Festival of England, the Teatro Comunale di Ferrara in Italy, the Santa Fe Chamber Music Festival and the Aspen Music Festival. He makes frequent visits to work with orchestras in China, including stops in Beijing, Shanghai and Guangzhou, among others. In fall 2001, Silverstein toured major European cities as a member of a quartet that included Pierre-Laurent Aimard, pianist; Tabea Zimmermann, violist; and Jean-Guihen Queyras, cellist. Silverstein has led eight international tours, as well as many United States tours. He has been a member of the faculties at Yale University, the New England Conservatory, Boston University and the Tanglewood Music Center. He holds honorary degrees from Tufts University, Boston College, Rhode Island University and the New England Conservatory. 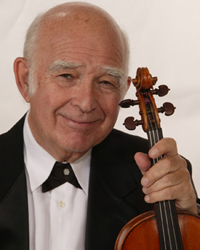 He is a member of the string faculty of the Curtis Institute and was an artist member of Chamber Music Society of Lincoln Center in New York for many seasons. General admission tickets for the Oct. 13 concert are $5 and can be purchased in advance by going to http://music.cmu.edu/events/197 or calling 1.888.71.TICKETS. Pictured above is Joseph Silverstein.